and a duty of adoration towards Christ our Lord. Sacristans work behind the scenes to prepare for the celebration of masses, baptisms, weddings, and funerals. They also help prepare the worship spaces for the celebration of the sacraments by polishing, light cleaning, and watering plants. The Sanctuary Team maintains the Sanctuary and vessels and prepares the altar area for worship. There are many other liturgies outside of Mass that are held within the sanctuary of the Catholic Church; Eucharistic Adoration is one of them. As faithful Catholics, we believe Jesus is the Body, Blood, Soul and Divinity in the Eucharistic presence in the consecrated host. As laity, we have the ability to pray and give respect before the Blessed Sacrament (Jesus in the Eucharist) when it is exposed for viewing and when it is not. 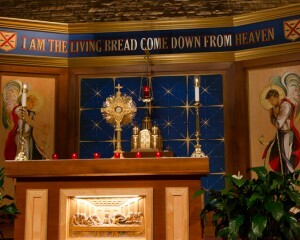 Eucharistic Adoration dates back to the early church. St. Basil, St. Francis Assisi, St. John Vianney and Alphonsus Liguori are among early adorers to the Blessed Sacrament. Eucharistic Adoration became more widespread following the institution of Feast of Corpus Christi on the liturgical calendar in the 13th century. 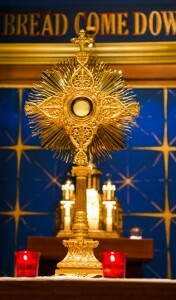 Anytime the Blessed Sacrament is exposed outside of the Tabernacle it should never be alone. There should always be faithful adorers present at all times to be with our Lord. Father Dan Leary brought to St. Andrew in September 2013, Eucharistic Adoration for 40 hours. This is a devotion for 40 continuous hours of prayer before the Blessed Sacrament in solemn exposition. 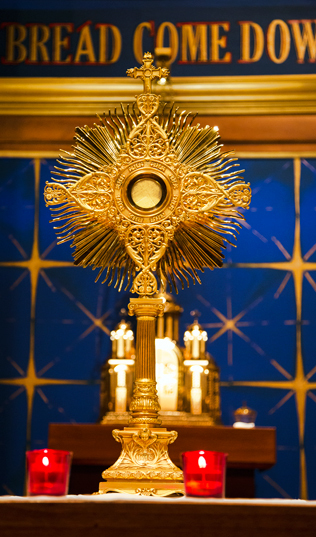 Exposition-The act of removing the Blessed Sacrament from the tabernacle and enthroning Him in a monstrance. Monstrance- from the Latin word monstrare, meaning “to show”. A monstrance is the vehicle that the Blessed Sacrament is displayed from the Altar. A monstrance is usually in a starburst design made with gold, silver or glass and became more widely known as the Feast of Corpus Christi expanded the devotion to our Lord. Luna-This is the small circular glass and metal container that holds the Blessed Sacrament within the monstrance. The Blessed Sacrament is moved between the tabernacle and the monstrance within the luna. 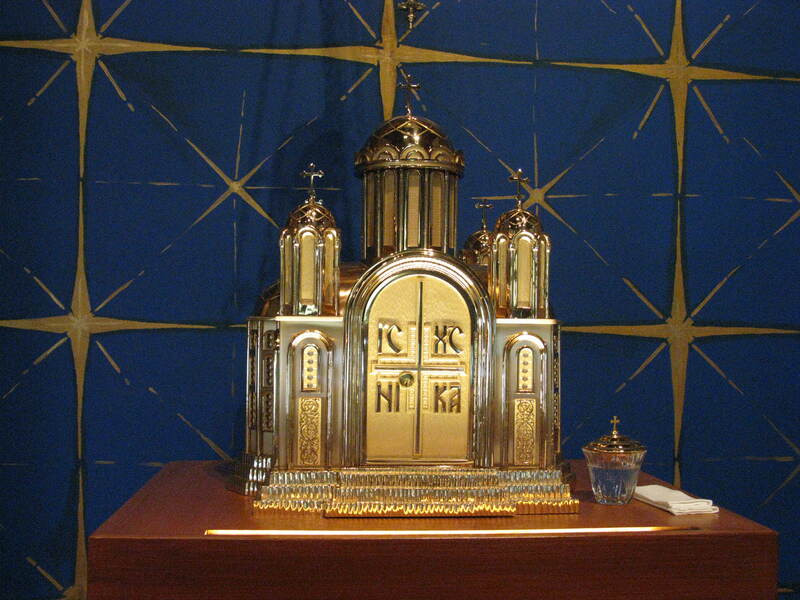 Pyx- When the luna is stored in the tabernacle, it has been placed in a standing pyx. Our pyx looks like a mini monstrance. A pyx is also referred to as a small, usually round gold container that a minister of Holy Communion (perhaps an ordinary minister such as a priest or deacon or an extraordinary minister as in lay person) takes Holy Communion to the homebound or sick of the parish. Candles- Four to six candles should be lit on the altar adjacent to the monstrance to draw attention to our Lord and His presence during the time of adoration of the Blessed Sacrament. Incense-The use of incense during Benediction is a sign of respect and reverence to Jesus Christ. It becomes an outwardly sign of our prayers going to heaven. The thurible is the container that holds and burns the incense. The boat holds the powdered incense that can be added to the thurible. Bells-The ringing of the sanctus bells, the Latin translation “Holy bells”, gives glory to God with joyful noise. The bells are rung when the presider is making the sign of the cross with the raised monstrance. Indeed, it is when Jesus is blessing the adorers present. The bells are drawing a sign of attention to the altar for the blessing. Vestments– The priest or deacon will wear an alb, which is white long-sleeved, ankle length, usually cotton. Additionally the alb will be tied with a corded belt called a cincture. The cincture is a symbol of purity and chastity. Also the presider will wear a stole. This is a long narrow band of cloth seven to nine feet long and four to six inches wide to indicate the presider has received Holy Orders. A priest wears the stole around the neck with both ends in front of his body. A deacon wears a stole diagonally across the body from one shoulder to the opposite waist. A cope is a vestment that the presider wears over their alb. It is white in color and opens like a cape with a clasp like closure at the chest or neck. A humeral veil is worn over the cope during benediction with the Blessed Sacrament is exposed. The veil is approximately 6 feet long and 2 feet wide and also white in color. It has a pocket like ends that the priest or deacon will place their hands. This is to respect Jesus in the Eucharist. The presider will wear the veil as he is raising the monstrance and blessing those present by moving the monstrance in the sign of the cross. The hands remain covered by the veil to indicate it is Jesus blessing us not the priest or deacon. Benediction-Benediction is defined by the act of the presider blessing the adorers present with the Blessed Sacrament by raising the monstrance. This is done at the end of an adoration time period. It encompasses reciting the Divine Praises and reposing the Blessed Sacrament back to the tabernacle. The Divine Praises-Following the Benediction blessing, the presider leads the congregation in the Divine Praises. This prayer was written by Luigi Felici, a Jesuit priest in 1797, as a means of reparation for blasphemy and profane language. It is a litany prayer whereby the congregation repeats after the presider a number of phrases to honor Jesus, the Blessed Mother, Joseph and all the Saints. Come experience Eucharistic Adoration at St. Andrew Apostle. Friday nights 7pm-8pm in the church. Get to know your Saint Andrew’s Sanctuary! Sanctuary- The sanctuary in any church, mosque or synagogue is a place of holiness. In the Catholic church we refer to the sanctuary as the consecrated area around the tabernacle or altar. Generally it is an area that the congregation attending Mass will not enter. Altar – The altar is where the holy sacrifice of the Mass is celebrated. At the hands of the presiding priest, and the actions of the Holy Spirit, the bread and wine we offer become the Body and Blood of our Lord Jesus Christ. There should be only one central altar in each church, this signifying one Christ and one Eucharist of the Church. The altar should be covered in at least one white cloth and nothing should be placed on the altar except what is needed for liturgical celebrations. Candlesticks and a crucifix are the only items that should remain on the altar when it is not in use. The altar should be located where it is positioned centrally in the main congregation space and have walking space around it so the presiding priest faces the congregation during the Eucharistic celebration. CCC 1182. (Catechism of the Catholic Church). Ambo – Coming from a Greek word meaning elevation, an ambo (or lectern) is the place where the Scripture of the Liturgy of the Word is read. Our ambo at Saint Andrew’s is not raised. In some larger churches you might see an ambo from which the readings are spoken and a second elevated pulpit where the Gospel is proclaimed and homily delivered. The Catechism states” The dignity of the Word of God requires the church to have a suitable place for announcing His message so that the attention of the people may be easily directed to that place during the Liturgy of the Word.” CCC 1184. 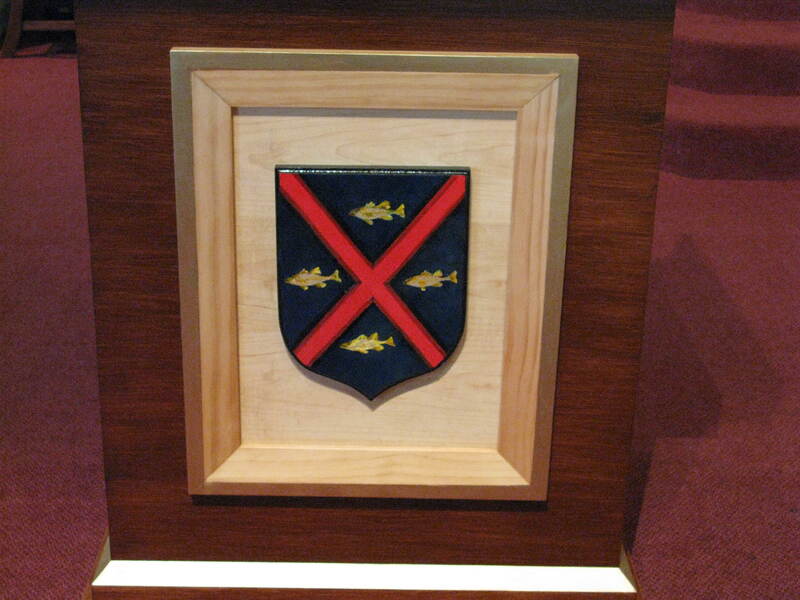 A crest for Saint Andrew appears on the front of our ambo, indicating the vocation of our patron Andrew, a fisherman, and an X indicating the manner of death Andrew received for being an apostle of Jesus Christ. Andrew died hung on a cross as Jesus had before him. Andrew requested of his perpetrators to have the wood frame on which he would die be different than that of Jesus. Lectionary – The lectionary is the book located at the ambo from which the Liturgy of the Word readings are spoken at Mass. Since Vatican II, the 4 passages of scripture are an Old Testament reading, a Psalm, a New Testament reading, and the Gospel. The Alleluia verse before the Gospel is either sung or not proclaimed at all. Our liturgical year begins at Advent and continues until the following December. Since Vatican II, we have 3 liturgical years which divides the scripture readings to be delivered at Mass. Currently, we are in year C, which focuses on the Gospel of Luke on Sundays. During the week in year C, the Gospel of Mark is spoken frequently. Not to be too confusing, but the daily lectionary readings are in a 2-year cycle. We hear from the ambo in a daily mass an Old Testament reading, a Psalm, and the Gospel. There isn’t a New Testament reading unless it is considered a high feast day. Presider’s Chair- The presider’s chair is where the presiding priest leading a liturgy sits in the sanctuary during a liturgy. Presider comes from a Latin word praesidere, which literally means to sit in front of. If there is any con-celebrant priest or deacon in the same liturgy they would be sitting in chairs on either side of the presiding chair. CCC 1184. Roman Missal – The Roman missal contains the prayers that the presiding priest prays during the Mass liturgies. There have been various editions and multiple revisions throughout the history of the Catholic Church. Since Vatican II, there have only been minor changes made. One of those changes is the expansion of the Eucharistic prayers for a priest to select; these are the Consecration prayers. The missal contains all the prayers for various liturgies, such as daily Mass, Sunday Mass, a funeral Mass and a mass devoted to Our Lady, among many others. The missal is the red book that an altar server brings to priest in the presiding chair at the beginning and end of each Mass liturgy. It is the same book the presiding priest uses on the altar for the Consecration. Sanctuary Lamp- You can’t speak of the tabernacle without the sanctuary lamp. Also known as the eternal flame or perpetual flame, the sanctuary lamp, is kept alight to signify Christ present in the tabernacle. “In accordance with traditional custom, near the tabernacle a special lamp, fueled by oil or wax, should be kept alight to indicate and honor the presence of Christ. (Roman Missal 316). Traditionally it set in a red votive. It is either hung above or placed beside the tabernacle in a stand. Tabernacle – This is derived from a Hebrew word meaning “dwelling place” or “residence.” The tabernacle is the place where the Most Holy Eucharist is reserved. 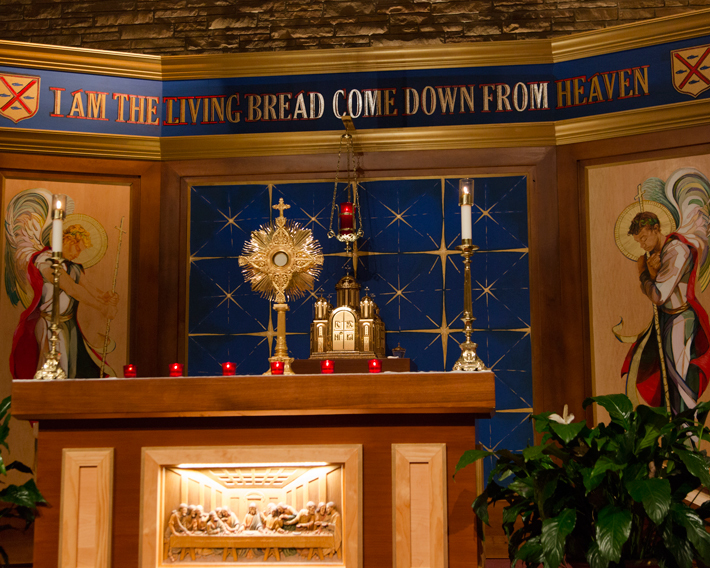 The tabernacle should be “in a most worthy place with the greatest honor…and should foster adoration before the Lord really present in the Blessed Sacrament” CCC 1183. In the early church, “the tabernacle was first intended for the reservation of the Eucharist in a worthy place so that it could be brought to the sick and those absent, outside of mass. As faith in the real presence of Christ in His Eucharist deepened, the Church became conscious of the meaning of silent adoration of the Lord present under the Eucharistic species” CCC 1379. Our tabernacle was a gift from a parishioner in Father Kennedy’s tenure as our pastor.